JAINA Calendar Committee is pleased to inform that JAINA 2019 Calendars are being mailed out. 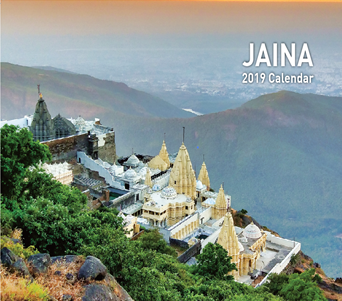 Your tax deductible donation makes it possible to distribute JAINA Calendars to over 15,500 Jain families free of cost. To support this project, please make your kind donation at the details given below. Jain Society of Metropolitan Washington pathshala has been growing for the past several years. It has over 160 students ranging from 3-15 years. Read more about it below. Only that science is a great and the best of all sciences, the study of which frees man from all kinds of miseries. Q 1: What is the Chauvihar? Q 2: What is the Attham? JAINA Calendar Committee is pleased to inform that JAINA 2019 Calendars are being mailed out from Los Angeles. The total cost to JAINA for this distribtion is approximately $82,500.00. Please donate generously to JAINA as this project is entirely supported by your valuable donations. Your tax deductible donation makes it possible to distribute it to over 15,500 Jain families free of cost. Every calendar has a pre-addressed envelope for your convenience to mail your donations. For any queries email to Mahesh.Wadher@gmail.com. The tax reform Act have a significant impact on charitable deduction. We strongly urge all of you to take full advantage of maximum tax benefit by writing your donation checks to JAINA and mail it to the address below or by online donation on or before Dec. 31, 2018. Please ask your tax advisor as to how it will impact you personally. But move fast—there are only few days left in this year to donate. It was an auspicious dawn that winter. 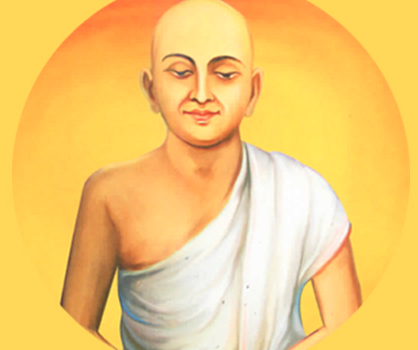 The Jain monk, respected Acharya Shantisuri maharaj saheb on his way to Tharapadpur had reached a village on foot. Due to entreaties from the village householders, a sermon was arranged. During the sermon, a celestial being named Nagini started dancing. Acharya saheb put some scented sandal dust hallowed by holy incantations (vasakshep) on her in order to make her sit at an appropriate place. She settled down thereafter. Thus whenever this celestial goddess used to start dancing, Acharya saheb used to put the sanctified sandal dust on her to make her move from the inappropriate to appropriate seating place. Jain Society of Metropolitan Washington is happy and proud to welcome so many new families and students to our growing and blossoming Pathshala! For 2018, JSMW have over 100 families and ~160 students ranging from 3-15 years! JSMW Pathshala is one of the largest patshala in the United States, after New Jersey, Los Angeles, Chicago, and Houston patshala. JSMW patshala has been growing for the past several years. JSMW has eleven core Pathshala classes, an optional sutra class, language classes in both Hindi and Gujarati and finally a competitive advanced Jain Academic Bowl. In addition to these youth classes, adult classes are also held every Pathshala. JSMW is also coming up with Jains Got Talent in January 2019. Stay tuned for the updates. 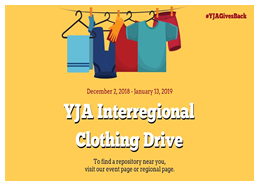 YJA is hosting its third annual Interregional Clothing Drive from December 2nd to January 13th to benefit individuals in your community that may be ill-prepared for the winter. From the gently-used coats at the back of your closet to the jeans that fit a little tighter than you'd like to admit, we'll take all of your new and gently-used clothing articles! Feel free to donates clothes for warmer seasons as well, because there will always be a need. Please see the clothing repositories organized by region: https://bit.ly/2LdoLWy. Please join the Jain community this year in spreading compassion! Feel free to reach out to your Regional Coordinator (listed above) or your Director of Events, Simmi Nandu (events@yja.org), should you have questions or want to set up a Clothing Drive receptacle in your locality. A 1: Chauvihar means one does not take any food or any liquids after the sunset until the sunrise next day. A 2: Attham means upavas for continuous three days.